Heat oven to 350°F. Spray 32 mini muffin cups with cooking spray. Make cookie dough as directed on pouch. Scoop heaping tablespoonfuls of dough into muffin cups. Bake 8 minutes. Immediately press dough in each using back of spoon to form cup. Bake 3 minutes. Using spoon, press dough into cups again; cups will hold shape after second pressing. Bake 5 minutes. Cool completely on cooling rack. To make ganache, in large microwavable measuring cup, mix chocolate and cream. Microwave uncovered on High in 30-second intervals, stirring between each, until stirred smooth. Spoon into cookie cups; top each with a raspberry. Refrigerate about 30 minutes to set. Store covered in refrigerator. This recipe calls for chocolate chip cookie dough, but you can use any cookie dough you like. 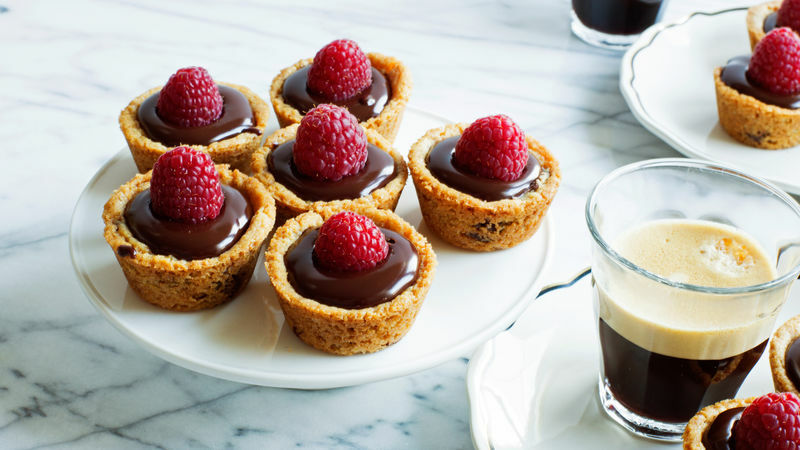 Raspberries and chocolate are always a delicious pairing, but any berry you like would be great on these tarts as well!